I'm just curious if anybody knows how viewBox values (i.e. viewBox="a b c d") are determined. I'm trying to understand Inkscape's SVG functionality, so what I've done is created a document in Inkscape that is 100px x 100px, drawn a line from the left side of the viewport (i.e. 0 horizontal value) to the right side (i.e. 100 horizontal value). Strangely, however, when I save this document as a Plain SVG file, and then open the file in a text editor, the viewBox values are set to viewBox="0 0 26.458333 26.458334" instead of, say, viewBox="0 0 100 100". Does anybody know how these values (0 0 26.458333 26.458334) are determined, and why there is seemingly no relation between them and the viewport dimensions? P.S. I know you can edit the viewBox property manually in the document options, but I'm still curious as to why Inkscape sets them to funky values. 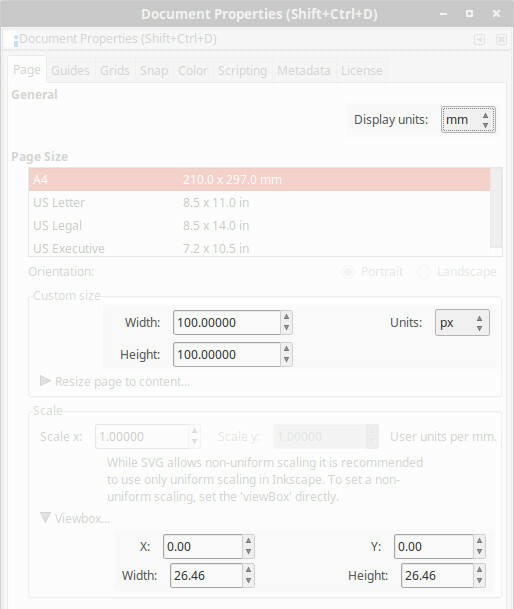 Inkscape uses mm as the default display-unit or user-unit for your document. User-units are used to store values in the SVG file. This tag describes a drawing size of 100px x 100px. The viewBox attribute defines that 100px x 100px is equivalent to 26.458333 x 26.458333 user units. The SVG scale factor would be 1px / 0.2645 user-unit, which can be used by a SVG renderer to convert all the values that are stored in user-units to the real-world drawing dimensions. So that's where the 26.45833333 comes from. Now the SVG scale factor is 1px / 1 user-unit.